Our Chocolate Amaretto Mousse is wickedly delicious. 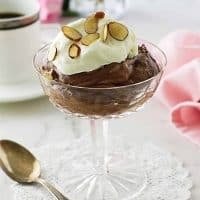 It is a feather-light, fluffy mousse that just melts on your tongue; there is a hint of almonds from the amaretto and the rich, smooth, creaminess will delight your senses. It is an elegant dessert and is a spectacular finale to any special-occasion meal. 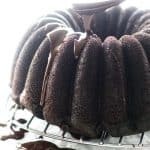 Are you planing a special-event dinner and want a special-event dessert, like maybe something gooey, sweet and chocolaty? Our Chocolate Amaretto Mousse will not disappoint and it is the perfect ending to a fine-dining experience. One of Don’s favorite desserts is Chocolate Amaretto Mousse. 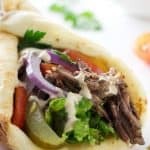 I have been keeping this recipe in my treasure box for 26 years and bring it out a couple times a year. 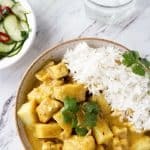 The recipe has been adapted from the 1988 issue of Gourmet magazine. A silky, rich and creamy Chocolate Amaretto Mousse. Use the best chocolate you can afford, as it is well worth the extra cost. I know this from experience as I once used some chocolate chips, the kind that are well known for their famous cookies and it was a disappointing experience. Most chocolate chips have a stabilizer included in the ingredients that are intended to keep the chips from melting in the cookies. It will also keep your mousse from having that smooth, silky consistency. I have also used regular Baker’s semi-sweet chocolate with good results. I must warn you though, this ultra-creamy sensation is not a low-calorie dessert and I only make this on very special occasions. Chocolate Amaretto Mousse, rich, smooth and delicious! Amaretto is a sweet, almond-flavored Italian liqueur that has a delicate almond taste. 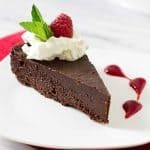 If you plan to make this dessert ‘kid-friendly’ and need to avoid the liqueur Torani® Amaretto Syrup may be substituted. Torani® syrups are available in a variety of flavors that are popular for fancy coffees. A variety of these syrups can usually be found in most grocery stores near the coffee selection. 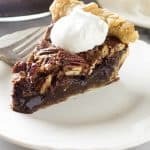 Almond extract is another substitute for the amaretto liqueur and if you use it just add a few drops at a time to achieve the desired light taste. 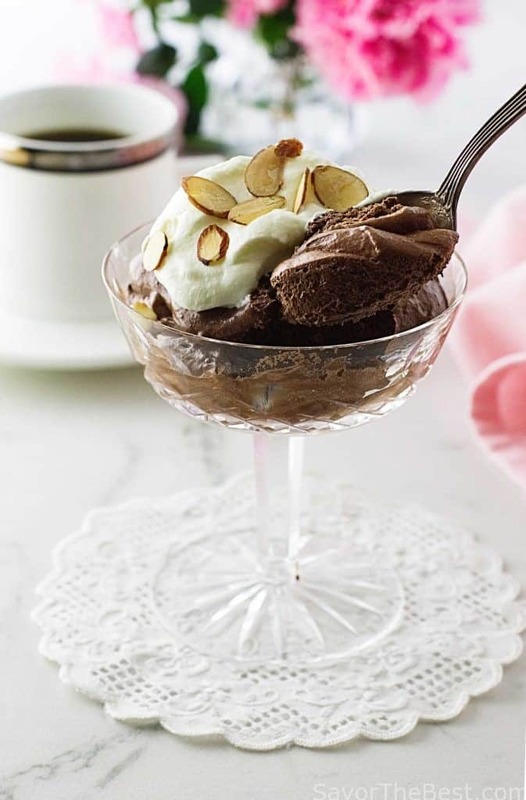 A decadent feather-light, fluffy chocolate amaretto mousse makes an elegant dessert. 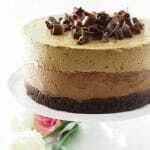 This Chocolate Amaretto Mousse recipe is a re-post with new photos. The original post was published on February 4, 2014. 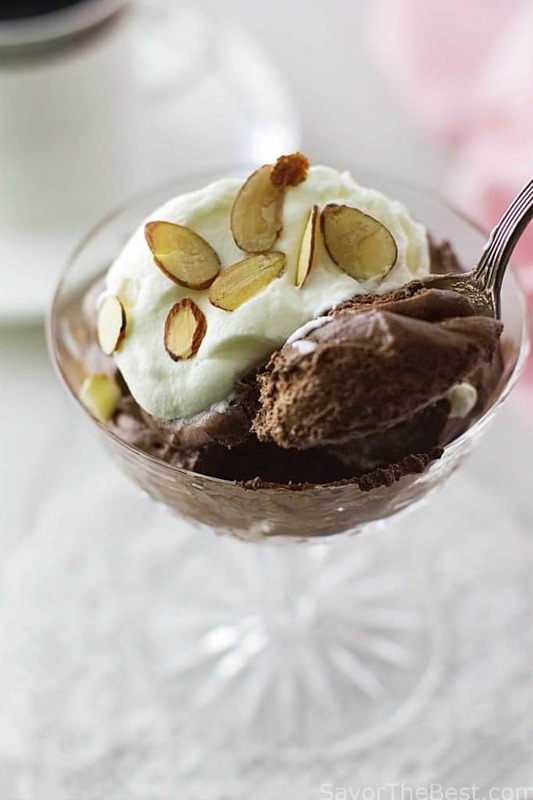 A decadent feather-light, fluffy chocolate mousse with just a hint of almonds. The rich, smooth, creaminess of this elegant dessert will delight your senses. Chop the chocolate into pieces and add to the top of a double boiler which is set over barely simmering water and allow to melt undisturbed. Meanwhile, in a large mixing bowl beat the egg yolks until they are thick and pale, beat in the Amaretto. Add the melted chocolate in a stream, beating until the mixture is combined well. In another bowl beat the egg whites until they just hold soft peaks, beat in ¼ cup of the sugar a little at a time and continue to beat the meringue until it holds stiff peaks. Beat in the vanilla. Stir one-third of the meringue into the chocolate mixture and fold in the remaining meringue. In a chilled bowl beat 1-1/4 cups of the heavy cream until it holds soft peaks, beat in the remaining ¼ cup of sugar and beat the cream until it holds stiff peaks. Fold the whipped cream into the chocolate mixture, gently incorporating it completely. Spoon the mousse into six wine glasses or dishes, cover with plastic wrap and chill for at least four hours. Just before serving, whip the remaining one-half cup of chilled heavy cream until it holds soft peaks, add the tablespoon of sugar and continue beating until it holds stiff peaks. 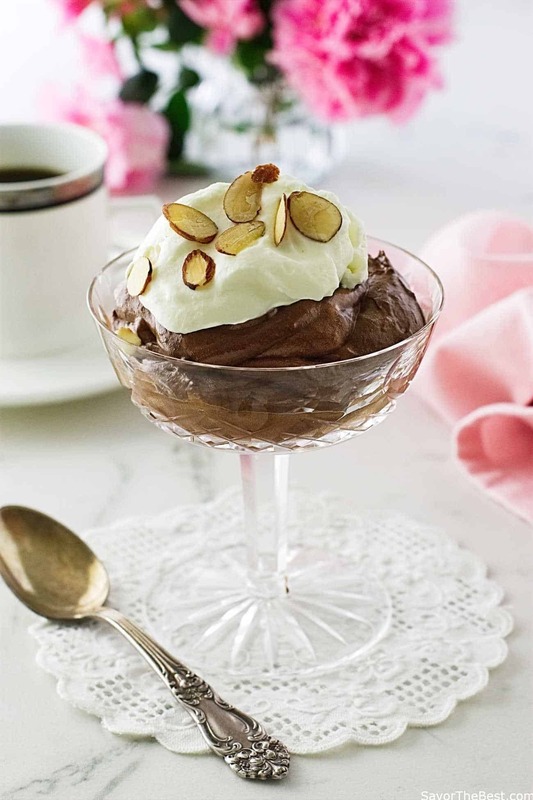 Top each serving of mousse with a dollop of whip cream and garnish with chocolate shavings or sliced toasted almonds. Torani's amaretto syrup may be substituted for the amaretto liquor in the same proportions. You may wish to add a small quantity of almond extract to increase the flavor. Nutrition Values do not account for the whipped cream topping. Hi, Jane…Oh, you are so right! I am happy to hear you enjoyed it….and you are welcome. Oh my goodness! 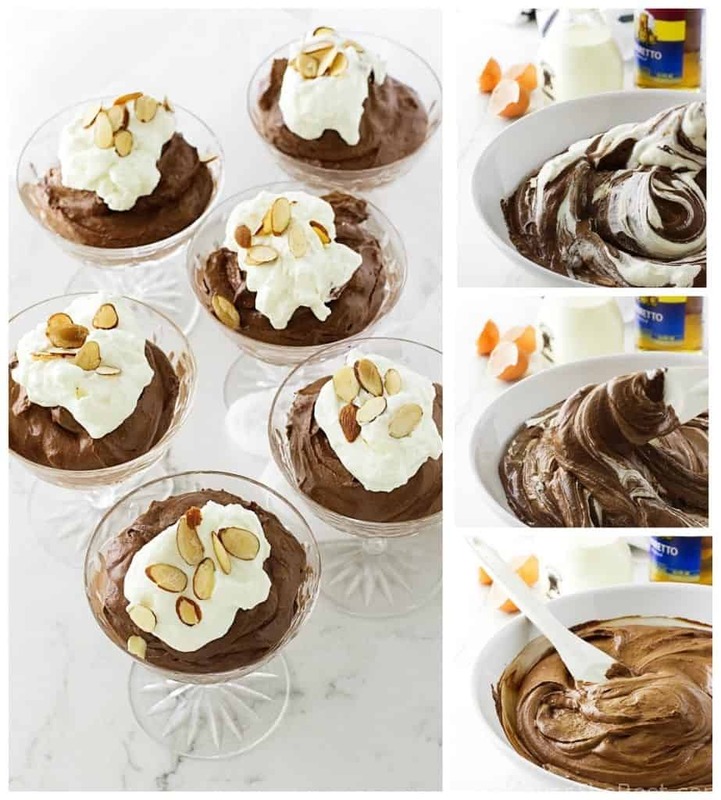 Your photos are such a delight and the choco-amaretto mousse sounds like such a winning recipe. I am definitely going to try this one as I have got some really good bitter chocolates my friend got me from her recent trip to Switzerland. Gorgeous photos! This almost looks too good to eat. However, I could eat them all! I love chocolate mousse. Never tried adding amaretto but sounds like a lovely addition. Thanks for sharing! sounds like a winner dessert, especially with the Amaretto! 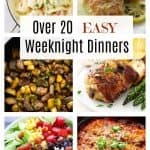 Will try it next time I have a dinner party. Stunning dessert and look so tasty! I love chocolate mousse! Can’t wait to try this! This really does look decadent. Best kind of dessert! You’ve outdone yourself with this — simply gorgeous. And delish too, I’ll bet. Thanks!